^ u just read my mind man this looks great but skyrush.... I'm speechless! 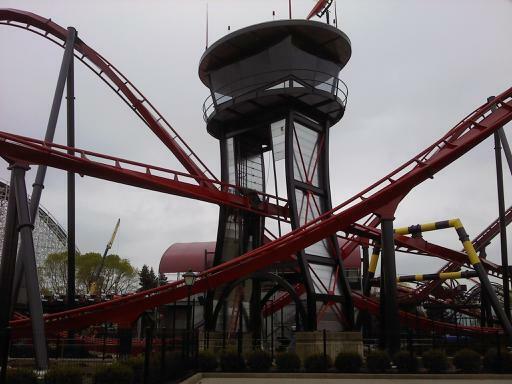 And it has also been announced on Twitter, that X-Flight will open to the world on May 16th! That looks pretty bleeping awesome!!! Looks like it get's very close to the ground is that the spot were the water feature is going? Thanks for posting that picture - it looks GREAT !!! Amazing pic. Who were the riders? One thing's for sure... it wasn't me! Wasn't me either, but that mini website is GREAT. Thanks for sharing! I wouldn't call it "mini". It's a nice site. Kinda late IMO, but better late than never! It looks nice, thanks for sharing. It also seems to appear the queue will go THROUGH the keyhole element! WOW - GReat pics Chris. Thank you very much for sharing. Where did you find them? I love how you see both trains in the pic. Water Feature IN ACTION BABY! Sweet! I didn't know it was going to have this element. I wonder if some people will get a little wet? What do you all think? GREAT pic! Water features always add to any coaster experience, glad to see this received one. It's about time we get a POV! Including reverse angle! Found this youtube video of X-Flight testing and it really looks GREAT. Here is another youtube off ride video that is even better than the last. Wow thanks for posting those vids Tom, it takes that in-line roll much faster then I had expected X-flight looks to be the best of the 4 Wingriders imo. I agree Rob. This looks like it will be the most forceful of all of them. Can't wait to see the ride reviews and POV videos. What interests me the most is the ride experience of the outer seats over time during those forceful elements. Am I the only one who thinks this looks better than Wild Eagle? I think it's the best looking and most forceful of all the wing-riders and I'm loven it. knottsnetwork wrote: Am I the only one who thinks this looks better than Wild Eagle? Glad we're all on the same train, now if we only lived closer to the park to experience it first hand. Nope! I think this is way better, especially it's affects... I can't wait to ride it later this month (hopefully) / mid June! thom25 wrote: Glad we're all on the same train, now if we only lived closer to the park to experience it first hand. IMO the only reason Wild Eagle was getting so much lip service was b/c it's at Dollywood. I'm not saying it isn't a good ride but come on if you take the wingrider trains off of it, it would be your standard B&M floorless coaster. There is nothing unique or original about WE besides the trains, I'm not saying that's a bad thing just stating the facts. of theming and making the area looks great. Nope. We are definitely all on the same page, and think great minds do think alike.